Ozzy Blackbeard: Short-row heels - yey or nay? Short-row heels - yey or nay? 1. They are difficult to get over my ankle, and feel tight across the top of my foot. This is causing the yarn to pull. 2. The back of the heel section stops quite low down my ankle compared to a heel flap. I forgot to mark it in the photo, but it's the orange bit below the Jaywalker pattern on the leg. I hope you can make the little arrows out (they're courtesy of PicMonkey!). 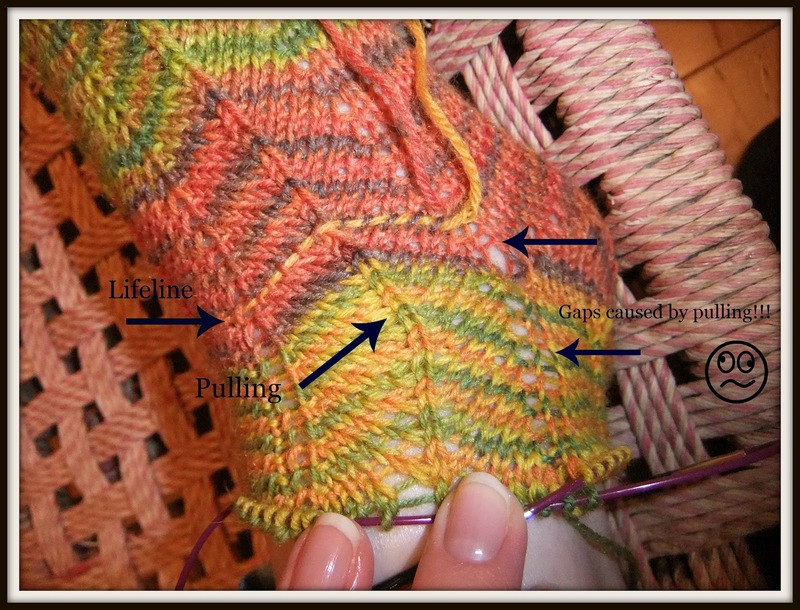 The tightness is making the yarn pull and distorting the middle stitch on the pattern, and also causing holes at the increase points on the pattern. It fits perfectly at the toes and across my foot. 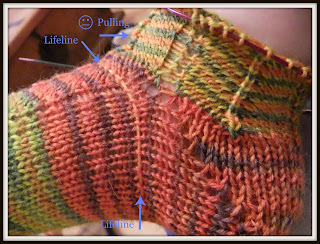 I am using the same number of stitches as I would with a heel flap sock, same needles and yarn I've used before (Trekking XXL). I'm pretty sure my feet haven't got bigger - sadly!! Because then it wouldn't be so hard to get shoes that fit! 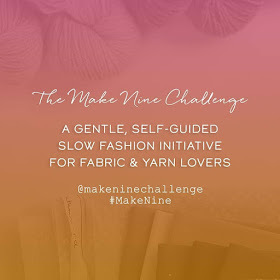 Anyway, I was wondering if anybody has done a short-row heel before, and could give me some advice, or point me in the direction of a good tutorial, because I haven't had much luck finding one. In the short-row heel's defence; it's definately a lot quicker and less fiddley than a heel flap though. This heel is definately going to be frogged. 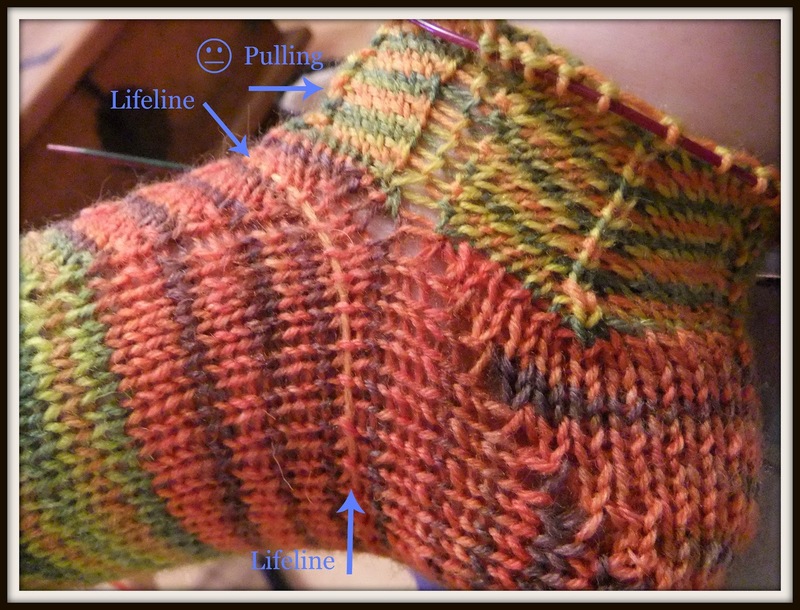 I'm so glad I put the lifeline in, it's where I would start the gusset increases for a heel flap. Now I just need to decide whether to give a short-row heel another go, or just do a heel flap. Here's what the bottom of the heel looks like. I do like the look of the short-row heel, but just not this one. And do you know how hard it is to take a photo of your sock when it's on your foot?! 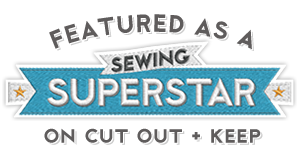 Um, if you're a sock knitter you probably do!! I have a FO to show you, it's my second All Seasons Cardi; but it deserves a post of it's own, so I shall do it at the weekend. Thank you in advance for any help or suggestions! hi. i've heard that the Jaywalker pattern usually is tight around the foot/heel, more for the pattern itself being rather unstretchy. I don't know if that includes the short row heel or not. i have used the SRH several times, and while it isn't my fav, it is nice to do, quite quick and fits fine. perhaps the stitch count was off, too low or something. Short-row heels are a much tighter fit around the ankle. 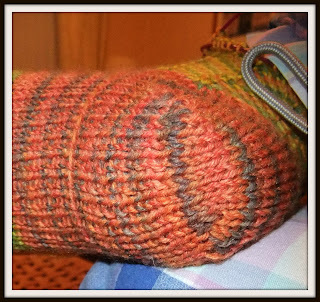 I've seen examples where a small mini-gusset's been made before starting the heel, which gives a bit more room. Can't remember where now though - you'll have to google for a short row heel with gusset. I prefer a gusset and heel flap for my socks these days as I find them more comfortable and more hard-wearing. Thanks for this! I hadn't heard of the mini gusset, I shall have to have a search for it. The old heel flap is definately looking like the winner here - there's a reason why it's so popular! I'm now wondering if SRH are really any good for anybody because my feet are tiny! !